Waxahachie ISD has experienced significant growth in student enrollment over the past five years. With a student population of more than 8,500, the district is continually on a quest for Excellence in Education. Although our students continue to do well both academically and in extra-curricular activities, nearly half of our students are economically disadvantaged. Enter Operation First Day of School. Any parent will tell you that there are a number of expenses involved when it is time to go back to school. School supplies, backpacks and more. Many parents cannot afford to purchase these items for one child, much less if there are several school children in the household. This major initiative will only be made possible through partnering with the wonderful Waxahachie community. The district is looking to partner with businesses, organizations, churches, and individuals to help us acquire school supplies, monetary donations, and volunteers to help run the event. Monetary donations will be accepted until August 1, 2018. Since 2009, Operation First Day of School has assisted more than 2,500 families and more than 8,000 children. Operation First Day of School will operate on a first come, first served basis. We hope that you will partner with us in this great initiative to help our future leaders be successful in the classroom. COLLECT general school supplies through your workplace, church or local non-profit organization. Click here for a General School Supply List. School supplies may be dropped off at the WISD Administration Building, Monday – Thursday, from 8:00 a.m. – 4:00 p.m. August 6 is the last day supplies will be accepted. Make a monetary donation to purchase school supplies. Donations can be made at the WISD Administration Building Monday - Thursday, from 8:00 a.m. - 4:00 p.m. They may also be mailed to 411 N. Gibson St., Waxahachie, Texas 75165, attention Public Relations Department. VOLUNTEER at Event. Please email jbridges@wisd.org if you would like to volunteer! 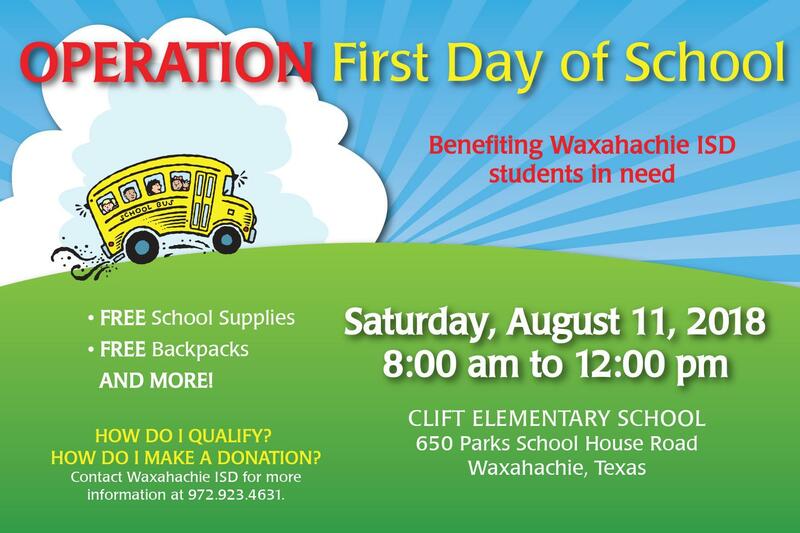 Please contact the Director of Public Relations for Waxahachie ISD for more information at 972.923.4631.